I often wonder what criteria food manufacturers and supermarkets use when applying the ‘V’ symbol to vegetarian products. I was searching for some balsamic vinegar on the Sainsburys website yesterday and the one I wanted did not have the V symbol on it. Is this because it is truly not vegetarian or is it because they simply did not use the symbol on it? There is a degree of trust implied when you see the symbol that you trust the manufacturer agress with what your definition of a vegatariaqn is. Artificial ingredients derived from animals, such as cochineal. If you are looking for vegetarian foods, I suggest you always double check the ingredients do not have any animal ingredients. A good place to start when looking for veggie foods in the Vegetarian Socity website list of approved products. When you then learn to know what constitutes a veggie-friendly ingredient you’ll be better informed when looking at ingredients lists. 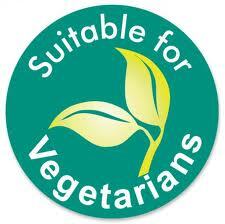 The ‘V’ sysmbol is a great way of knowing what is veggie but my advice is to always look beyond it for 100% certainty.